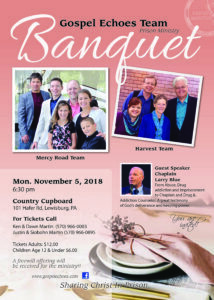 The Gospel Echoes Team Prison Ministry Annual Lewisburg Banquet will be held at Country Cupboard Restaurant, 101 Hafer Rd., Lewisburg, PA, Monday, November 5, 2018, 6:30 PM. The evening will include a delicious Country Cupboard Buffet, Gospel Music, and special guest speaker Ex-Inmate Larry Blue. Larry’s life was transformed by the power of God from addictions to serving as Prison Chaplain, Drug Counselor and currently serving as Recovery House Inspector for the State of Indiana’s over 90 Recovery Centers. Banquet tickets are Adults $12.00, Children Age 12 and under $6.00. Call Ken & Dawn Martin 570*966*0003, or Justin & Sibohn Martin 570*966*0895.